Said to be the first cemetery in the Colorado Springs area, this cemetery was established in 1859. It was located on a ridge between Red Rock Canyon and the old Colorado-Philadelphia reduction works, northwest of the present junction of 31st Street and Highway 24. The site was chosen because it protected burial parties from surprise attack by Indians. It was abandoned because during the winter the ground was too hard to dig. Said to be the second cemetery in the Colorado Springs area, this cemetery was established in 1859. It was located at old Jefferson and Lincoln Streets, currently in the block between 25th and 26th Streets and West Pikes Peak and West Kiowa Avenues in Colorado Springs. It was abandoned in 1869 and all burials reportedly moved to the Old County Cemetery. The following article appeared in the Colorado Springs Gazette, Nov. 8, 1935. Crews working in Monument Valley park have found a marble tombstone, inscribed with the name of Jacob M. Maring, evidently an 8-year-old boy, imbedded in the sands of the creek, apparently washed there by the Memorial day flood. A letter "M" encircled by a wreath appears at the head of the stone. Where the tombstone came from is an unsolved mystery, as no one has been found who knows of a cemetery in the area hit by the Memorial day flood. Officials believe it may have been washed from the west slope of the Black forest, altho no burial ground is known to have existed there. It is not known what happened to this Maring tombstone after its 1935 discovery in the Fountain creek bed in Colorado Springs. The 30 May 1935 flood devastated Colorado Springs. 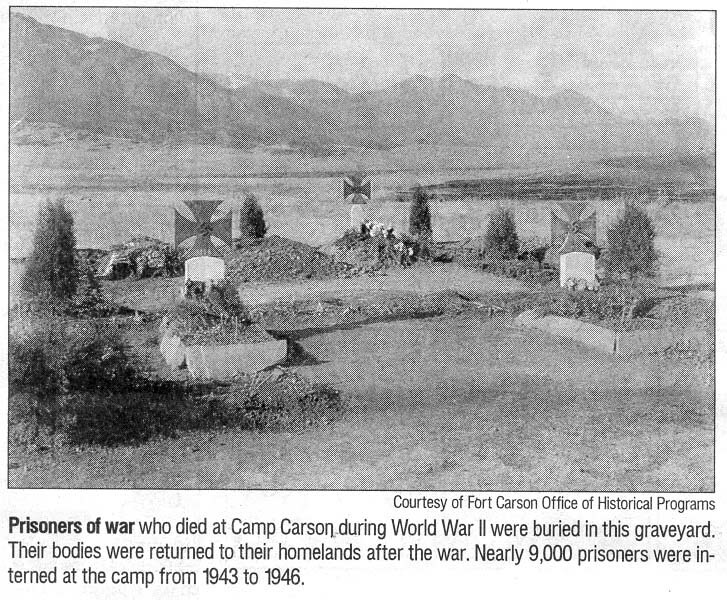 Located near Gate 3 of the current Fort Carson, this cemetery was used during World War II when Camp Carson housed a prisoner-of-war camp. After the war, all burials were shipped back to their homelands. The following photo of the cemetery appeared in the Colorado Springs Gazette, August 7, 2001, page Life3.